When we got to England, they did not know what to do with us. This group of us, we did not know English, so they put us in a special class, it was terrible. * Interview with Yael Nemenoff (formerly Lotte Rosendahl) by project group Kindertransporte in Kfar Hanassi, Israel, 2012 (translation: Cordula Lissner). 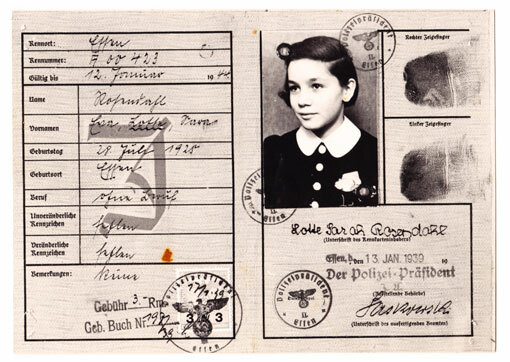 Passport of Lotte Rosendahl, issued in 1939. Credit: Courtesy of Yael Nemenoff. Picture above: The girls of Willesden Lane 243 (detail). Photo credit: Courtesy of Yael Nemenoff.